I have always identified as a runner. I ran cross-country and winter track in high school, logged countless miles in western NC during my college years, ran the St. Jude marathon in 2012 and half in 2014 and currently love running on the W&OD trail here in western Loudoun. To me, running is its own form of mediation and physical release, much like yoga. However, I did not start actively practicing yoga and barre while running until moving to Round Hill and joining the Yoga Time community in Purcellville, but I really wish I had. I have always known and appreciated the value and importance of cross-training (although, I’ll be honest, there have been a lot of times in my life when I didn’t do it enough). I love to swim, have previously taught Zumba and have many at home work out DVDs that I regularly do in addition to running. In my opinion though, there really is something extra special about the relationship between yoga and running. Running, especially longer distances on pavement can have brutal impacts on your knees and hips over time, in particularly if you are not taking the time to strengthen your muscles and stretch them out properly – that’s where barre and yoga can be a HUGE benefit. The isometric low impact exercises you do in a barre class strengthen and tone important muscles runners often overlook but are important ones close to your bones that help strengthen your knees, hips and core. I wish I had been practicing barre while training for my marathon, I think it would have made a big difference in strengthening my whole body (and mind). Barre is so great for strengthening your feet, which is an important thing for runners. It also helps stretch you out and elongate some of the muscles that tend to cramp up when you run long distances. It helps improve your balance and tighten your core, which enables you to be a more efficient and powerful runner. Most of all (for me at least) barre is a super mental workout which challenges, builds, and strengthens mental endurance. I don’t think I’ve gone through one entire barre class without at some point being fatigued to the point of wanting to stop. Pushing through those moments is sometimes more about mental rather than physical endurance. The same can be true sometimes when you’re running. There are times you just hit a mental block where you don’t think you can go any farther (this happened to me quite frequently in the upper miles of my marathon). Pushing through those moments is extremely tough, but super rewarding. It can take a ton of mental strength and endurance to run long distances, and barre is a great way to build that mental fortitude. Yoga is also good and perhaps arguably the best thing for runners. It has many of the same benefits as barre mentioned above. There are many different types of yoga classes that can build strength, stretch muscles, calm the mind, and help you breathe more deeply. I love the strength a power yoga or vinyasa flow class helps build, especially through the core. It’s something that I think has helped improve my running posture. A slow flow class really helps you concentrate on moving with your breath, which is also an important part of running. Personally, my favorite class at yoga time in terms of running is Deep Stretch and Myofascial Release taught by Mindy on Tuesdays and Thursday mornings from 9:30-10:45am. From the website, “This class focuses on deep release in the joints and tissues of the body, especially the back, hips, thighs and legs. Focus on these tissues has a better effect on stretching and exercising the joint areas of the body. To understand myofascial release, we must first understand fascia. Imagine a very strong dew-covered spider web encircling a shrub. And between the gaps in the threads is a clear gel, rather than air. If you can picture this, then you’re on your way to understanding fascia. This three-dimensional complex matrix threads itself throughout our body, surrounding our muscles, organs, nerves, bones, blood vessels and even our cells. Everything is held together and in place by fascia. It is impressively flexible and infinitely adaptable. And because fascia is a very strong, very connected spider web, when one spot on it gets tugged or pulled or injured, the effects ripple throughout the body. This is why we may have pain in our knee that may have nothing to do with a knee injury, but everything to do with an injury to our lower back. The natural, fluid state of the fascia has been traumatized, causing it to harden and tighten. Myofascial release techniques (MFR) are designed to go in and smooth out those hard knots, returning the fascia to its normal fluid and adaptable self. In MFR, a gentle, sustained pressure is applied to points of restriction (those bunched up spots), allowing the connective tissue to release. The focus on deep stretches in this class paired with using props like tennis balls (which sometimes “hurt so good”) to work out kinks and knots in your muscles is so important for a runners body, which takes a lot of impact from the ground. Plus, if you’re like me, you don’t always stretch for as long and as deeply as you should after running – making a class like this even more important. Some of my best runs since moving here have been after this class. 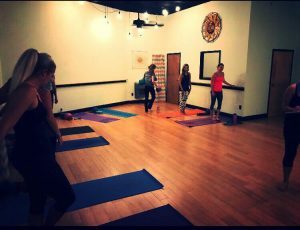 Everyone is different and has their own reasons and goals for going to Yoga Time Studio and practicing barre and yoga. Barre and yoga are great workouts on their own, however, the added benefits they give to me as a distance runner are one of the main reasons I run for the mat.